Every spring, prospective McGill students begin to receive their offers of admission. These students will have among the highest grades of their graduating class: The mean grade 12 academic average for an accepted non-Quebec Canadian student was 93.7 per cent in fall 2017. However, McGill’s extremely competitive admissions cutoffs make the university susceptible to certain problems: For example, grade inflation is pervasive, particularly in private schools accessible only to the upper class. McGill must ensure that its admissions process does not give the children of affluent families an unfair advantage. Grade inflation, by its nature, worsens over time: Schools that market their students’ sky-high post-secondary acceptance rates have to boost their students’ grades each year to keep up with competitors. Some students even go outside of their regular high-schools in search of a better GPA, opting to ‘buy grades’ by taking more difficult classes at ‘credit mills’ outside of their schools. In 2011, a Toronto Star investigation found that the Toronto Collegiate Institute, one such credit mill, was giving its students final grades that were mathematically impossible given their test results. These courses provide an unfair advantage to students who can afford to access these outside classes: A representative from TCI told the Tribune a in phone call that they charge $450 for a grade 12 biology course. The admissions process for the University of Waterloo’s (UoW) Faculty of Engineering provides a template for how McGill and other universities can address this problem. Beginning in the 1990s, the UoW faculty began to measure grade inflation across Ontario high schools and adjust for it in their admissions process. After determining the difference between students’ grade 12 and first-year university marks, UoW determined the overall average for each school: If students from a particular high school have significantly lower grades when they arrive at university, Waterloo infers that their high school was padding their grades. Future applicants’ marks are adjusted accordingly during the admissions process. McGill should follow UoW’s lead and launch their own internal investigation on grade inflation statistics. Still, Canadian admissions processes are fairer than their American counterparts: For example, admissions essays and extracurricular activities, common considerations in the US, are typically reserved for the most competitive programs in Canada. Including these non-academic factors stacks the deck in favour of students whose families have the means to support these often expensive pursuits. Legacy admissions, a concept relatively unseen in Canada, still gives US students an advantage if their family are alumni. Furthermore, the consideration of non-merit-based factors in university admissions has historically been used to bar entry to students from particular ethnic backgrounds: McGill maintained an unofficial cap on the number of Jewish students it would admit until after World War II, and Harvard University is currently being sued for allegedly discriminating against Asian-Americans in its admissions practices. McGill’s grades-only approach offers a more level playing field. For most undergraduate students, the only non-academic factor included in applications is an optional letter in which applicants can explain why their transcripts may not accurately reflect their potential. Exceptions at McGill are the Faculty of Education, whose prospective students are required to submit a letter of intent, and the Faculty of Music, which also requires an audition and music reference letter. 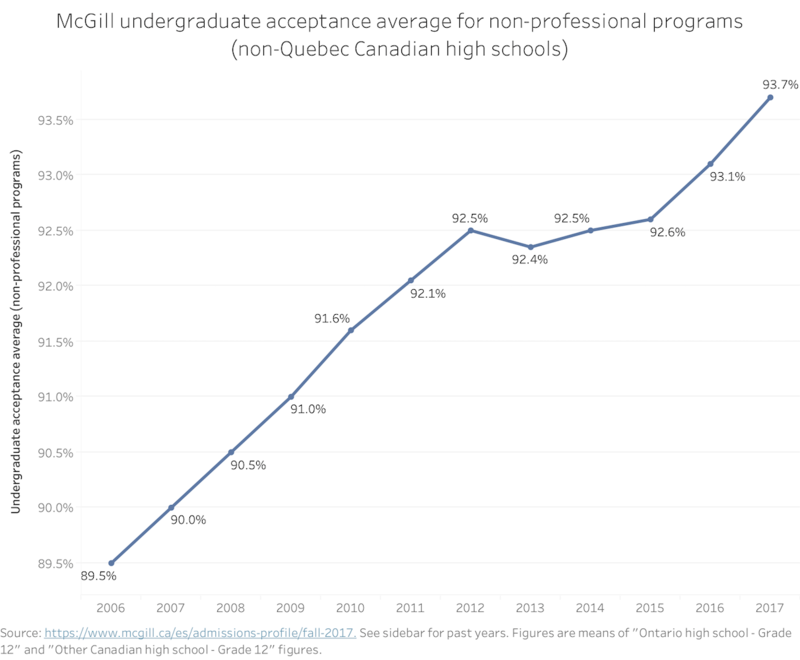 However, this relatively equitable system is also more vulnerable to the effects of grade inflation: McGill’s mean acceptance average has climbed by approximately 0.45 per cent every year since 2006 with the exception of 2013. Wealth will always provide advantages within a university and beyond. However, universities have a responsibility to minimize any unfair advantages. An equitable environment for students is not just an intrinsic good; fostering a meritocratic system, where any student’s talent can flourish, enhances McGill’s academic climate. McGill must take steps to address the threat that grade inflation poses to equity—for its applicants’ benefit and its own.